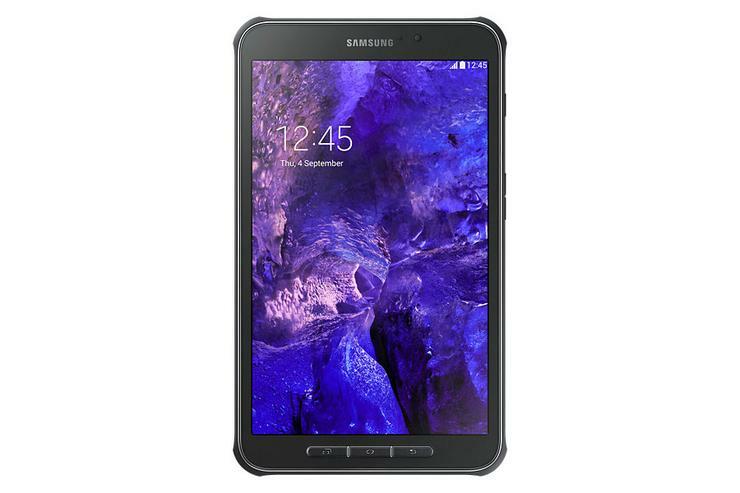 Samsung’s first B2B tablet, the Galaxy Tab Active, has gone on sale in Australia. The tablet has been designed from the ground up for use in the business space. Samsung held workshops with Fortune 500 companies active in retail, logistics and transportation, and the resulting feedback inspired the design and features of the Galaxy Tab Active. The spec sheet balances performance with durability. Features of note include an IP67 tough rating, external pogo pin contacts for convenient charging, Samsung’s Knox security solution and a removable 4450 milliamp-hour battery that Samsung claims can keep the slate charged for 11 hours. The tough rating certifies that the Tab Active is resistant to dust; can withstand water a metre deep for thirty minutes; and endure temperatures ranging from -20 degrees to 60 degrees celsius. Samsung offers an optional case that will protect the 8-inch tablet from drops 1.2 metres high. Computing specifications are modest. The 8-inch display has a 1280x800 resolution and backlighting 400 nits bright. Powering the slate is a 1.2GHz quad-core CPU, 1.5GB of RAM and 16GB of internal storage. The Tab Active runs Android 4.4 KitKat and the operating system uses 5GB of the internal storage. Memory can be expanded with support for microSD cards up to 64GB in size. A 3.1MP rear camera can be used “for barcoding scanning”, while a front 1.2MP camera can be used for video conferencing calls. Single-band Wi-Fi 802.11n, NFC and Bluetooth 4.0 round out the tablet's connectivity repertoire. Pricing for the Galaxy Tab Active starts at $699 for a Wi-Fi variant. 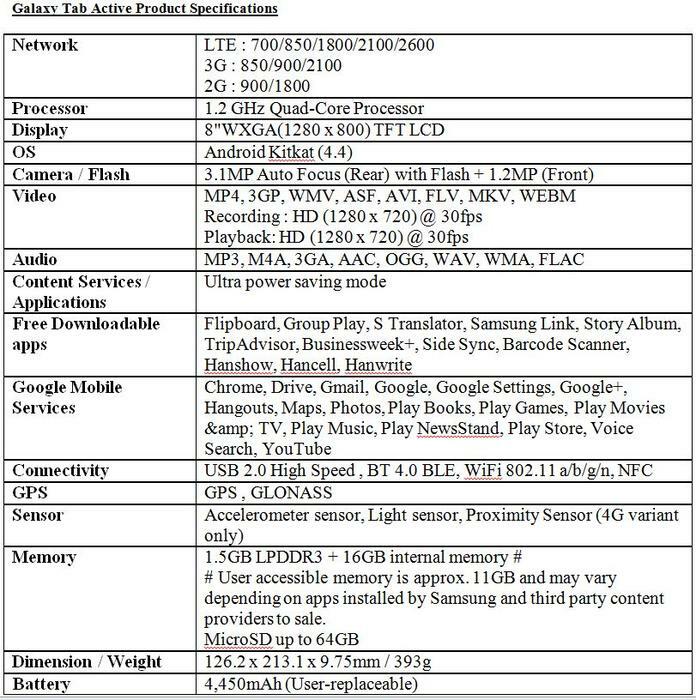 The 4G version of the tablet has a retail price of $849.